Gonzaga University was overjoyed to welcome new Zags to our community! Orientation Weekend was jam packed – full of activities that were designed to welcome, inform, and excite our First Year students! Our student orientation leaders welcomed the class of 2022 in bright teal shirts that said “Ignite”. These shirts served as a reminder to Zags to “Ignite YOUR Spirit” throughout the weekend. Orientation Weekend was designed to unite the new Zags, which would allow for a community to foster growth and development. 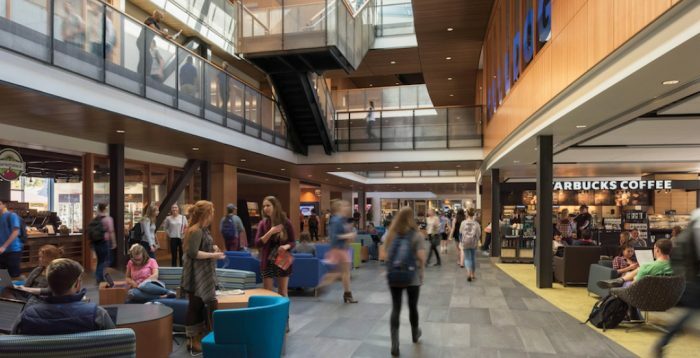 The First Year Students were broken up into small groups, in an effort to allow everyone to get to know one another, and provide a safe place for students to begin their Gonzaga experience. This new chapter is full of excitement and we understand that students are experiencing many different emotions. Adapting to new surroundings, new friends, new academic challenges, and a new routine are just some of the transitional experiences that new students encounter. The faculty, staff, and fellow Zags have welcomed your student into an inclusive community that focuses on the development of the whole person, aligning with our Jesuit mission and values. Following a meeting with their small groups, the class of 2022 gathered together in Mulligan Field to take their class picture! After the picture, students made their way to eat dinner in the Hemmingson center. Dining in community is a great way to foster both individual growth and growth within the greater student body. The Hemmingson Center was full of smiles and excitement as students began to tour the variety dining options and meeting spaces. The John J. Hemmingson Center is a place that makes an effort to provide a warm and inviting atmosphere to all. It is the perfect place for students to eat, study, meet friends, have club or organization meetings, and relax! The Hemmingson Center is excited to announce that Wolfgang Puck Pizza has opened on the first floor! This is the first Wolfgang Puck Pizza to be placed in a University environment, so we are very excited! It shares the first floor with Starbucks, US Bank, and our very own Marketplace. Welcome Night took place on Saturday night where students were energetically welcomed by some fellow students! Student body President, Athena Sok, welcomed Zags and shared her own experiences, in regards to some of her challenging moments throughout college. Following her welcome message, a few of our school spirit teams welcomed the new students. Gonzaga’s very own Kennel Club taught Gonzaga’s famous “Zombie Nation” that is done at every basketball game. The Cheerleading team led chants and showed off their newest flips and tricks, to pump up the Class of 2022. In addition, performances by GU’s Bomb Squad and Dance Team were showcased. We are ecstatic to welcome your bright and inspirational students into “their home away from home”, here at Gonzaga University. Weekend Movies: All GU students are invited to come enjoy FREE movies that will play in the Hemmingson Auditorium on Fridays & Saturdays at 7pm. GSBA Coffeehouse: Students can come take a study break in the Hemm Den to enjoy free coffeehouse style concerts at 8pm on Wednesday nights. Follow, Like, Join Our Group! We are located in the Crosby Student Center, Suite 100.